32 THE SHOP APRIL 2019 Two-Step Oil System Treatment Hot Shot's Secret, Mt. Gilead, Ohio, introduces its Two-Step Oil System Treatment—Stiction Eliminator and FR3 Friction Reducer. Safe for gas- and diesel- powered vehicles, the system treatment provides four major benefits: improved power and compression; reduced lifter and valve noise; reduced engine wear; and an increase in fuel economy. Stiction Eliminator provides overall cleaning of the engine's oil system, while FR3 Friction Reducer offers long-term engine performance, restored power and improved mpg. 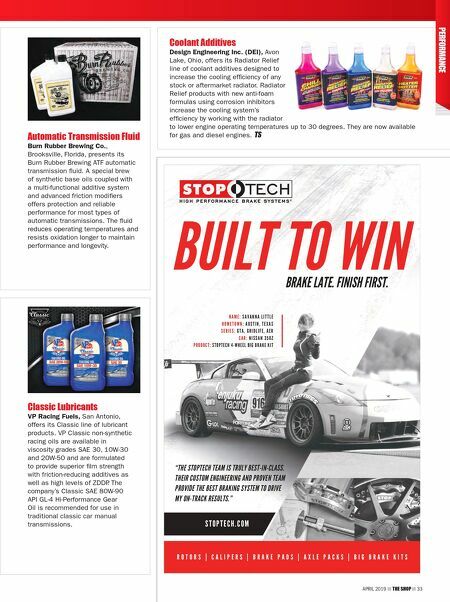 DOT 4 Street Brake Fluid Hawk Performance, Solon, Ohio, introduces HP520 DOT 4 Brake Fluid. The fluid is made for high- performance street specifications with a minimum dry boiling point of 500 degrees, and pairs with Hawk street pads and Talon rotors. HP520 is suitable for use in the hydraulic brake systems of all street vehicles. Upgraded Engine Oil Total Specialties USA, Houston, offers upgraded TOTAL CLASSIC engine oils, including TOTAL QUARTZ 5000 and 7000 series oils. Designed to meet the evolving needs of modern engines by providing the new API SN PLUS specification, the new TOTAL QUARTZ 7000 Future XT semi-synthetic oils are tailor-made for the requirements of OEMs and now have approvals from Ford and GM that were not carried under the CLASSIC line. They carry the API SN PLUS specification to combat LSPI issues seen in newer engines. European Motor Oils CRP Automotive, Cranbury, New Jersey, presents three new Pentospeed application- specific motor oils for European vehicles. Formulated to deliver performance and fuel economy, the 0W-20 Pentospeed motor oils cover more than 3 million VIO and feature the following OE approvals: Pentospeed LL-14 (BMW-approved for Spec. LL-14); Pentospeed VCC (Volvo-approved for Spec. VCC RBSO-2AE); and Pentospeed SP IV (Volkswagen- approved for Spec. 508.00/509.00). All three oils combine additive technology with ultra-high-performance base oil. 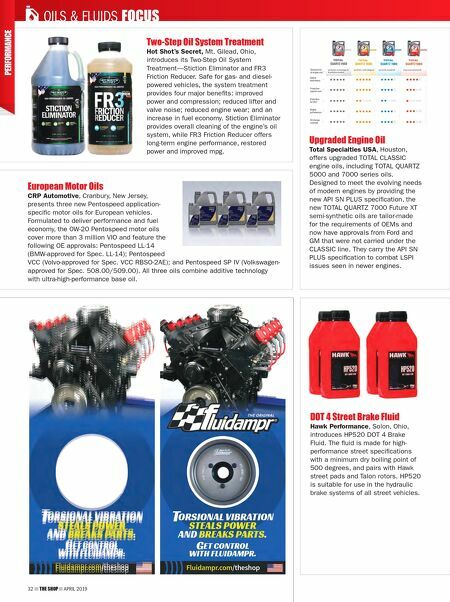 OILS & FLUIDS FOCUS Fluidampr.com/theshop T ORSIONAL VIBRATION STEALS POWER AND BREAKS PARTS. G ET CONTROL WITH FLUIDAMPR.